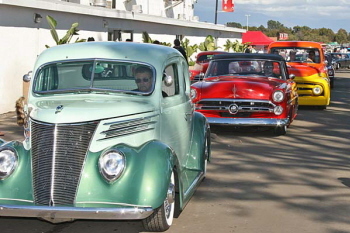 Eight years ago, the first Cruisin’ For A Cure was held at, what was then called, Irvine Meadows. It rained the night before and into the morning. 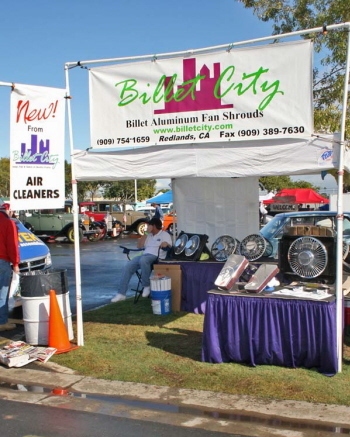 A regular car show would have been cancelled, but the “Cure” is not just another car show. 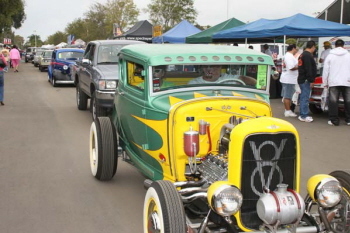 Then as now, this event draws Rodders together for the noble purpose of Prostate Cancer research. 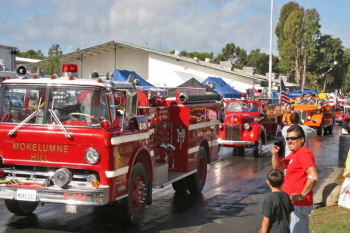 I think many participants say “I know it’s raining but I’m going for the cause”. 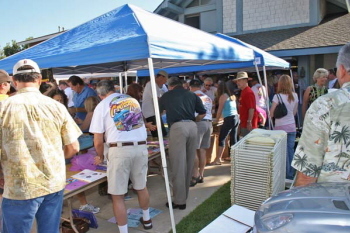 Many participants were unable to attend, but because they pre-paid, they too, supported the cause. 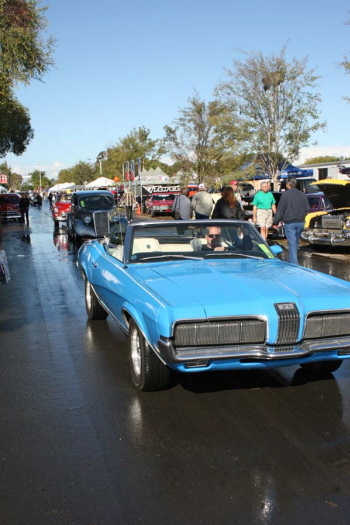 From its humble beginnings Debbie Baker and her volunteers have created the largest single day car cruise in the country. 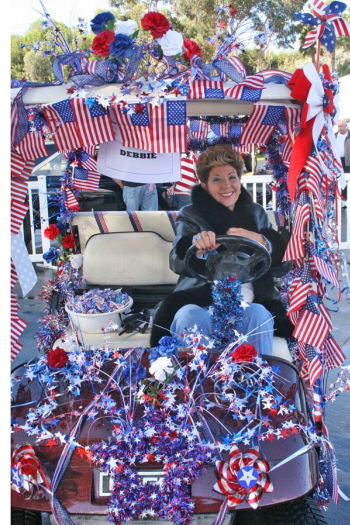 Volunteers stuff over 1500 Cruisin’ For A Cure “Goodie Bags”! 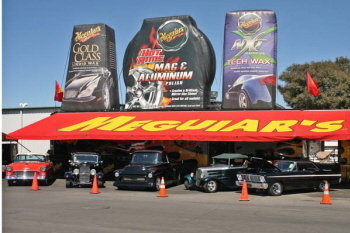 Barry and Meguiar’s products always stand out at the “Cure”. 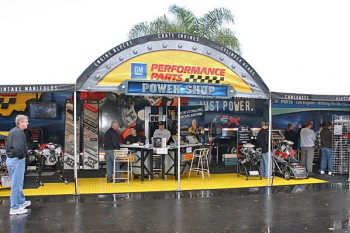 GM Performance Parts Group was on-hand with plenty of cubic inch muscle. 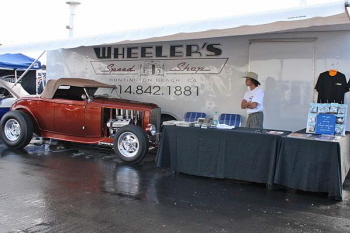 The local Huntington Beach, CA. 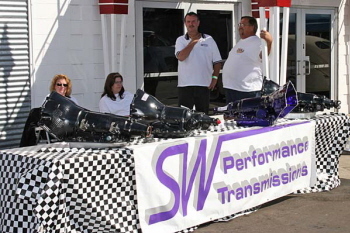 SW Perfromance Transmissions and Wheelers Speed Shop were showing their wares. 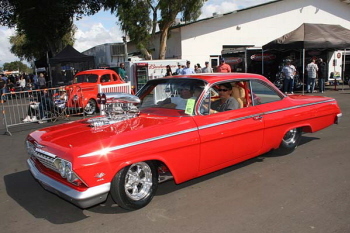 Pinstriper Jeff Styles can “pull a line” with the best of ‘em. 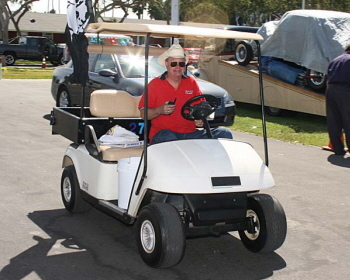 I don’t think Ross Kroenert and Debbie Baker are going to get their golf carts mixed up. 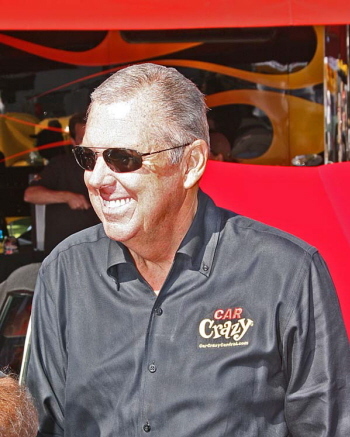 The event “T”shirt looks like this. 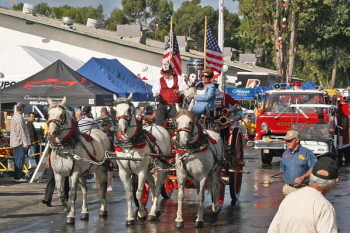 After the Opening Ceremonies we have the traditional (since the first “Cure” was in Sept 2001 just after “911’ attack) Parade of Fire Trucks, lead by Debbie Baker in the horse drawn steam engine. 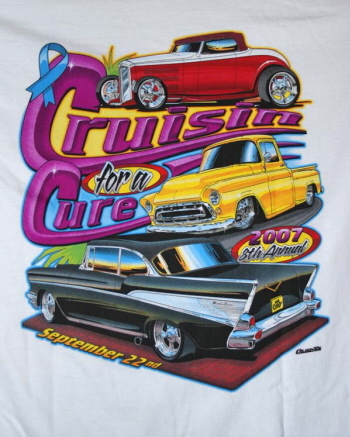 Cruisin’ For A Cure has a new logo. The cruise route was dry and crowded most of the day. 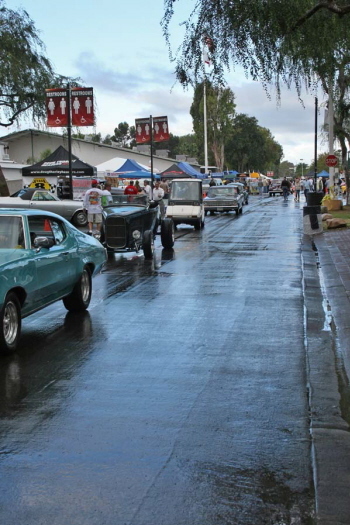 The 2 mile cruise route was a little damp till about 10:00am. 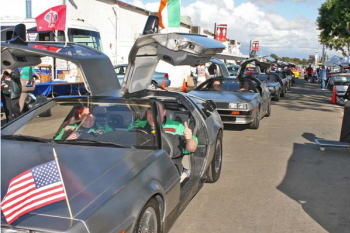 Check out those 6 Delorean, “Back to the Future” clones. 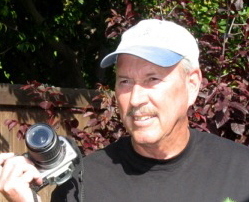 Over the last 30 years, Whitey from Hesperia, CA. 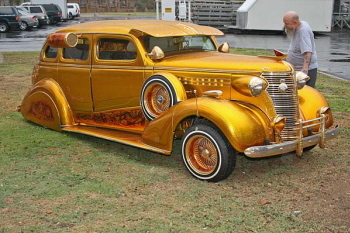 has customized his ’38 Chevy 4 door sedan. 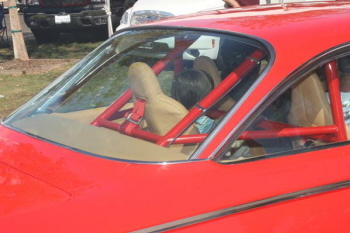 The first picture is when he drove it in, when I came by later it looked like it had “exploded”! 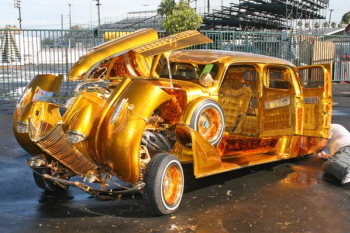 The superior craftsmanship Whitey has put into this is amazing. 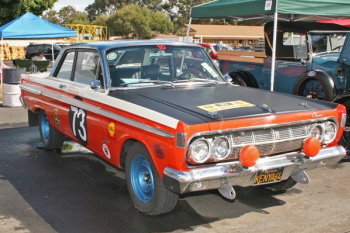 This recreation of the “East African Safari” ’64 Comet originally driven by Ray Brock is currently owned by his daughter Sara Rollins of Costa Mesa. 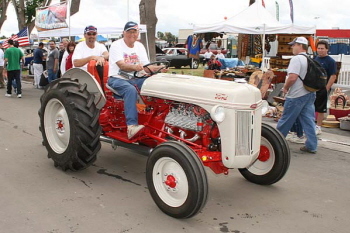 This is the coolest cruiser, it’s a flathead powered Ford Tractor driven by Charlie Tachdjian of La Verne, CA. 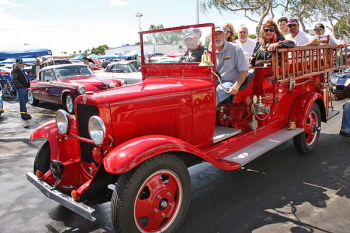 Matt Tachdjian driving his friends around in his 6 cylinder ’32 Chevy Fire Truck. 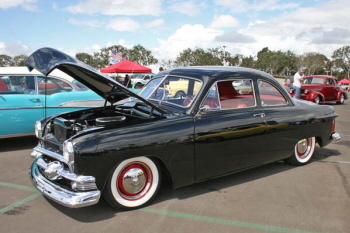 This beautifully crafted 351 Ford powered ’51 Ford Coup was built by its owner Greg Benoit of Costa Mesa, CA. 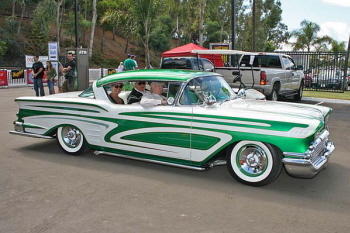 Santini just finished the scalloped paint on this ’58 Chevy Impala owned by Sam Dekruyf of Newport Beach, CA. 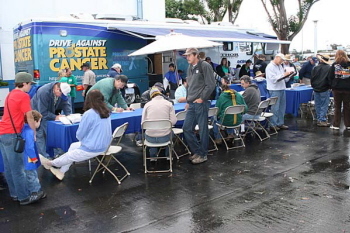 The “Drive Against Prostate Cancer Van” was opened for FREE PSA cancer screenings. Over 900 men were tested! 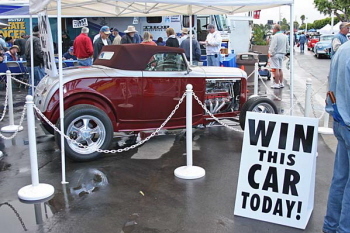 The giveaway Downs Dearborne Deuce went to “Lucky” Jerry Fialowski of Lomita, CA. 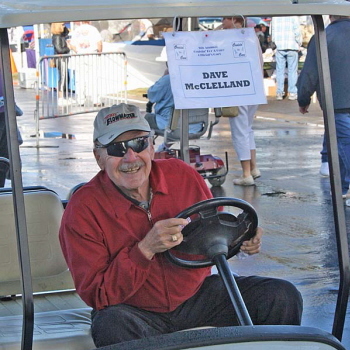 When Dave McClelland wasn’t providing informative announcements, he was cruisin’ in his golf cart. 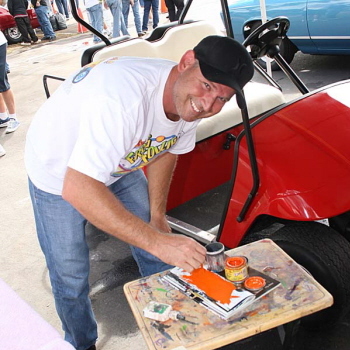 Great job Dave! 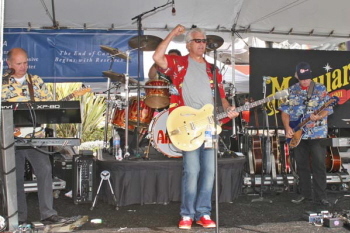 During the day “The Answer” provided live entertainment on the main stage.